This tool was made possible through open source contributions from Brad Payne and Alex Paredes of BCcampus. You can create both individual glossary terms or a full glossary list for your book. 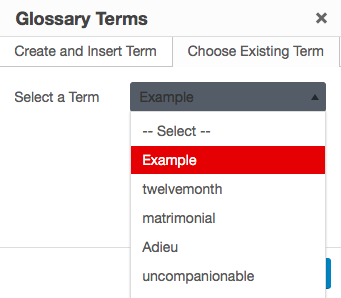 Glossary terms are underlined in your Pressbooks webbook, and display the term definition in a tooltip when clicked. Users can click the term again or press the esc (escape) key on their keyboard to close the tooltip. The tooltip will also close if the user clicks another glossary term on the page. The glossary list displays in all supported formats: webbook, PDF, digital PDF, EPUB, and MOBI. The glossary list is a consolidated, alphabetized list of all glossary terms which have been selected to show in the glossary list. The design of the glossary list is dependent on the theme and the book format. Glossary definitions can also be styled with links, bold, or italics with the Glossary Term visual editor toolbar. These styles will display in both the glossary list and the tooltip. Read on for more details about how to use these features. There are two methods to creating a glossary term. 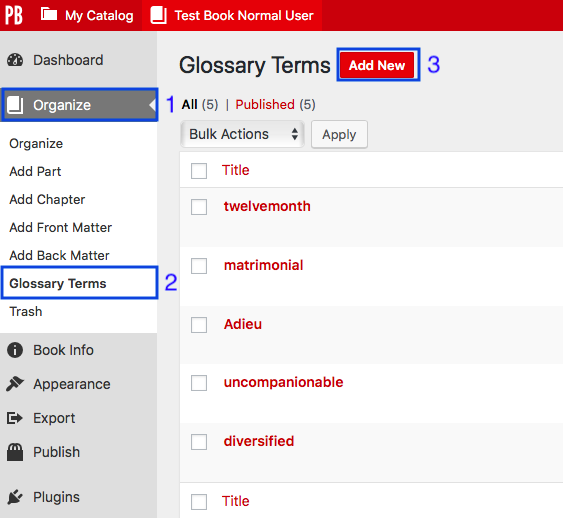 You can either create your terms on the Glossary Terms page before you place them in your book, or you can create the terms directly from inside the content editor of your chapter, front matter, or back matter. A shortcode will be inserted for your glossary term. If you’ve highlighted an existing term to give it a definition, the shortcode will wrap around the term. If you’ve created a new word while adding the glossary term, that word will appear wrapped in the glossary term shortcode. The shortcode is visible in the visual editor, but is displayed as a functional tooltip in your webbook. 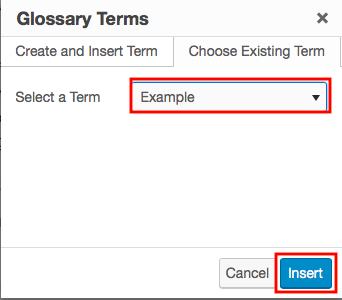 NOTE: Unlisted terms, or those not selected to “Show in Glossary List” are still available as glossary terms in the “Choose Existing Term” list. 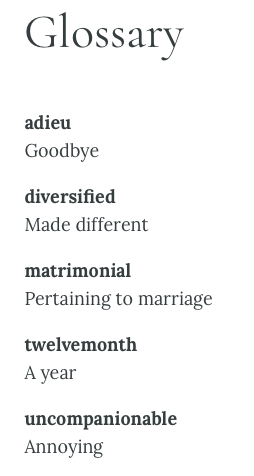 A Glossary List will contain all listed glossary terms you’ve created for your book. By default, all terms will be listed. 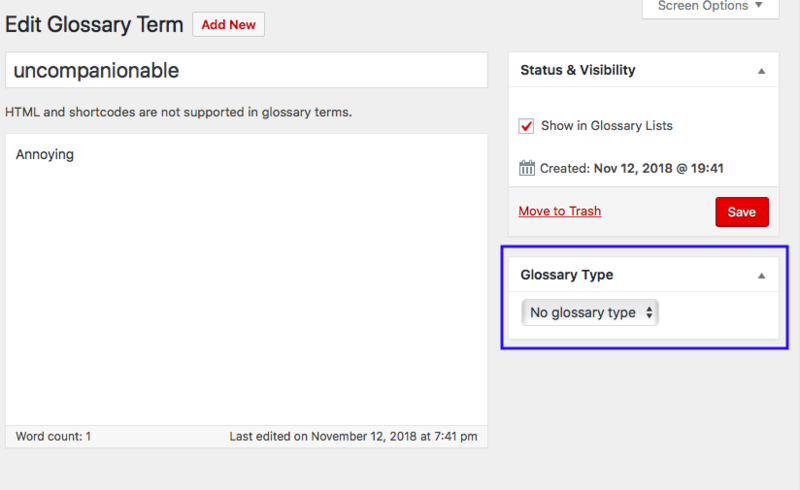 You can choose whether or not a term is listed when creating a new glossary term through the Glossary Terms page, or when editing any existing glossary term. 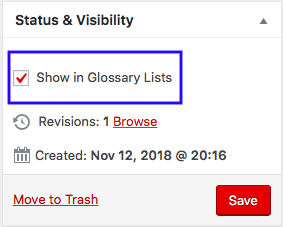 To exclude a glossary term in your glossary list, uncheck “Show in Glossary List” in the Status & Visibility menu on the glossary term editor page, then save your changes. 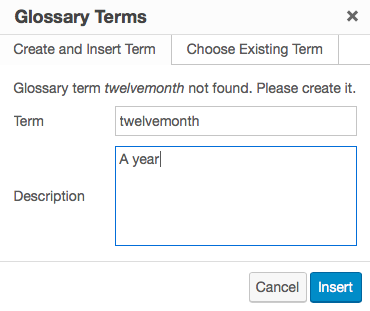 To include a term in the glossary list, leave this box checked. 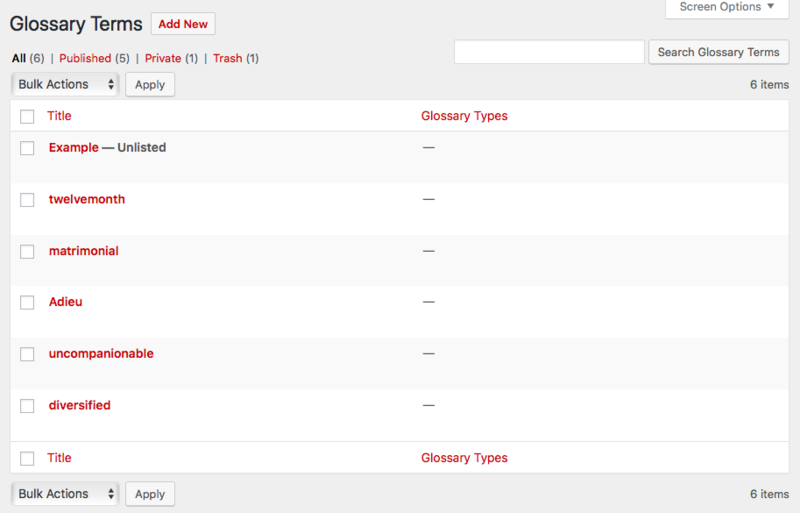 You can see a list of all terms and their listed or unlisted status by going to Organize > Glossary Terms from the left sidebar menu of your Pressbooks dashboard. NOTE: You must leave the glossary back matter content blank in order for the glossary to be generated. The glossary list will be generated and displayed in all supported export formats, as well as the webbook. Pressbooks does not support different Glossary Types at this time, and we recommend leaving this menu set to “No glossary type.” However, this functionality may be expanded in future versions of the Glossary tool.